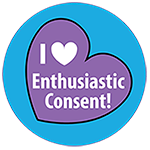 Show your love of enthusiastic consent with this 1.5″ standard steel pin back button that says “Waiting for HELL YES” on a white background. 1.5″ Square Button with “Waiting for HELL YES” written in red and black on a white background. The back has a standard steel pin closure and says www.11thPrincipleConsent.org around the borders.